Aluminum could be a perfect choice when a lighter weight is preferred. It's often more comfortable for extended use. Another nice feature of aluminum is it's rapid response to changes in temperature, so a ring will quickly warm up to your body temperature. Or hold it for a few moments under running hot water. A warm ring will reduce shrinkage of your package when putting it on, and get you on the playing field fast. Our brushed aluminum bands, donuts and head/shaft rings are precision machined in the USA from the finest aerospace quality billet aluminum. They are tough, durable, sanitary and ready for action. When your're off the sexual playing field, the light weight, smooth design and attractive finish make them ideal for longer term ornamental wear. They are also excellent for custom work. 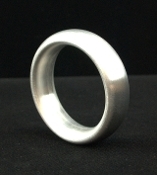 On several of our billet aluminum styles, we can have a personalized message engraved on the ring for you.